Design and development of most of the missiles used with air defense systems over the forty years that followed was accomplished by Pavel Dmitrevich Grushin (the organization later known as Fakel MKB) Beginning with his 32B alternate to the S-25, Grushin developed a series of missiles that were the bane of American and Israeli pilots during the cold war - the S-75 (SA-2 and SA-N-2 Guideline), S-125 (SA-3 and SA-N-1 Goa), S-200 (SA-5 Gammon), S-300 (SA-10 and SA-N-6 Grumble), Shkval (SA-N-3 Goblet), Osa (SA-8 and SA-N-4 Gecko), Tor (SA-15 and SA-N-9 Gauntlet), S-300 (SA-10 and SA-N-6 Grumble). Grushin also provided the exo-atmospheric interceptor missiles for the V-1000, A-350 (ABM-1), and A-135 (ABM-3) anti-ballistic missile systems. At the time of Grushin's death on 29 November 1993, MKB Fakel had produced over 16 basic types of surface-to-air missile, 30 modernizations of these basic versions, and exported missiles to over 50 countries. L V Lyulev (at OKB-8 GKAT, later EMKB Novator named for L V Lyulev), responsible for the unique Krug (SA-4 Gainful) ramjet-powered missile, and later the super-high acceleration missiles for the A-135, Buk (SA-11 Gadfly), and S-300V (SA-12 Giant/Gladiator) systems. The KB-1 design team responsible for the S-25 stayed in place, headed by Aleksandr Andreyevich Raspletin (1954-1967) and Boris V. Bunkin (1968-2000). Later known as Almaz TsKB, they were responsible for overall system design and integration for the S-75 (SA-2 Guideline), S-125 (SA-3 Goa), S-200 (SA-5 Gammon), and S-300 (SA-10 Grumble) missile systems for the Army and PVO Air Defence Forces. The Altair State Design bureau was responsible for all naval air defense systems development. They early on determined that only solid propellant rockets were suitable for naval use. A group dedicated to anti-ballistic missile systems, known today as Vympel TsNPO, broke off from KB-1 in 1968. For development of man-portable and small vehicle-mounted air defense systems (often integrating guns and missiles) traditional Army integrators entered the missile development system in the 1960's - Nudelman and Nepobidimy. Follow the links below to understand the history, development problems, and performance of each of these systems. Baranov SAM Russian surface-to-air missile. First Soviet anti-aircraft barrage rocket, fired in limited numbers during siege of Leningrad, and downing two German aircraft. R-102 Post-war Russian version of German Schmetterling surface-to-air missile. 16 test flights made at Kapustin Yar between 18 October and 19 December 1949. Not put into production, cancelled in favor of the R-112. R-117 Russian surface-to-air missile. Soviet surface-to-air missile design of 1948-1950. Developed in competition with the R-112 (derived from the German Schmetterling) but with new aerodynamics. Cancelled without ever flying in 1950 in favor of further development of the R-112. 205 missile Russian surface-to-air missile. Original missile of the S-25 system, development described above. Krug Russian surface-to-air missile. Ramjet-powered long-range surface-to-air missile, deployed by the Soviet Union and its allies. R-101 Post-war Russian version of German Wasserfall surface-to-air missile. Never put into production, but technology used for further surface-to-air and surface-to-surface missile developments in Russia. R-108 All-Russian second generation version of the R-101, itself a derivative of the German Wasserfall. Development began in May 1949 but the missile did not reach flight test stage before its cancellation in 1951. R-109 Russian derivative of the German Wasserfall, an interim design between the R-101 and R-108. The missile did not reach flight test stage before it was cancellation in 1951. R-112 Russian surface-to-air missile. Soviet surface-to-air missile design of 1948-1951. Propulsion and guidance based on that of the R-102 (copy of German Schmetterling) but with new aerodynamics. Cancelled without ever flying in 1951 when decision was made to proceed with a new generation of SAM designs. S-25 Russian surface-to-air missile. First surface-to-air missile deployed by the Soviet Union. Under a crash program ordered by Stalin, development began in 1951, first guided launch was in 1953, and by 1956, 2,640 launchers were deployed in defense of Moscow. The system was upgraded with improved missiles and ground systems into the 1960's. R-103 Post-war Russian version of German Taifun anti-aircraft barrage rocket. Developed and tested in 1947-1951 but abandoned in favor of the R-110. 206 missile Russian surface-to-air missile. The 206 was a version of the 205 using a single-chamber Isayev engine in place of the four-chamber design of the 205. Cancelled in April 1953. 207 missile Russian surface-to-air missile. This was an improvement of the 205 with an improved warhead and reduced cruise thrust. Trials were conducted of the missile in 1953, but it was decided not to put it into service. 32B Russian surface-to-air missile. Alternate missile developed for the S-25 system. Technically superior but not put into production, it led to the S-75 and later Soviet surface-to-air missiles. Dal Russian surface-to-air missile. Trials of this long range surface-to-air missile were conducted in 1960-1963 but the project was cancelled after the system failed to down a single target. V-200 missiles were installed in the Dal installations built around Leningrad for the failed missile. In a bit of disinformation, the V-400 was paraded in Moscow, and US intelligence, thinking it was operational, applied the SA-5 designation. The SA-5 code was transferred to the V-200 after the La-400 was cancelled. 17D Russian surface-to-air missile. Prototype air-breathing surface-to-air missile, using air-augmented solid propellant. 207A Russian surface-to-air missile. The 207A, with numerous improvements to the 205 which had been developed in a crash program, completed trials in 1955 and rapidly replaced the 205 in PVO service. It basically doubled all of the performance characteristics of the 205. 18D Russian surface-to-air missile. Variant of the 18D air-breathing surface-to-air missile using a magnesium alloy in the fuel to double the initial launch thrust. 215 missile Russian surface-to-air missile. The 215 was a derivative of the 207A with a nuclear warhead. It entered service in 1957. R-110 Larger caliber Russian version of the German Taifun anti-aircraft barrage rocket. Developed and tested in 1948-1956 and reached the initial production stage, but cancelled due to the inability to produce an economical rocket with the necessary consistent range accuracy for the barrage role. 22D Russian surface-to-air missile. Prototype surface-to-air missile, using liquid-propellant ramjets in place of the air-augmented solid propellant of the 17D. V-1000 Russian anti-ballistic missile. First Soviet anti-ballistic missile system. Development began in 1956 and the system was tested at Sary Shagan 1960 to 1961. It was clear that enormous development work was needed to achieve an operational anti-ballistic missile system. Therefore work began on the successor A-35 system, although the Americans were led to believe that an operational system was deployed around Moscow. The System A anti-ballistic missile equipped with the V-1000 rocket made the first intercept and destruction in the world using a conventional warhead of an intermediate range ballistic missile warhead coming in at 3 km/s on 4 May 1961. The US did not demonstrate an equivalent capability until 1984. 217 missile Russian surface-to-air missile. The 217 was a version of the V-300 with a variable thrust engine. Entered production. 207T Russian surface-to-air missile. The 207T was an alternative derivative of the 207A with a nuclear warhead. It was developed during 1958 but does not seem to have entered service. 217M Russian surface-to-air missile. Developed together with the improved S-25M missile system, the 217M entered production and gave the S-25 an enormous performance in improvement. S-75M Russian surface-to-air missile. Last production version. Fakel-designed missile; Almaz upgrade offered. Dal-2 Russian surface-to-air missile. Planned next generation high performance long-range surface-to-air missile developed 1959-1963. Cancelled together with basic the Dal system at the end of 1963. Dal-M Russian surface-to-air missile. Planned improved version of the Dal high performance long-range surface-to-air missile developed 1959-1963. Cancelled together with basic the Dal system at the end of 1963. S-75 Russian surface-to-air missile. Known in the west as the SA-2 Guideline, this weapon was responsible for the downing of more American aircraft than any missile in history. It was deployed worldwide beginning in 1957, and improvements and updates, many by third parties, continued into the 21st Century. RM-205 Russian surface-to-air missile. Drone version. 208 missile Russian surface-to-air missile. In this version of the V-300 the warhead was increased to 430 kg to compensate for accuracy problems in the original production version. Cancelled in favor of the 207A. RM-207 Russian target drone. Retired 207A missiles converted to use as target drones were given this designation and the code name Belka. S-200 Russian surface-to-air missile. Enormous surface-to-air missile developed by Grushin after the failure of the Dal project. Deployed in limited numbers and exported to countries in the Mideast to defend against American high-altitude, high-speed SR-71 reconnaissance aircraft. S-300V Russian surface-to-air missile. Mobile, multiple-target, universal integrated surface-to-air missile. The S-300V system can fire either of two versions of the containerized missiles loaded: long range and medium range. 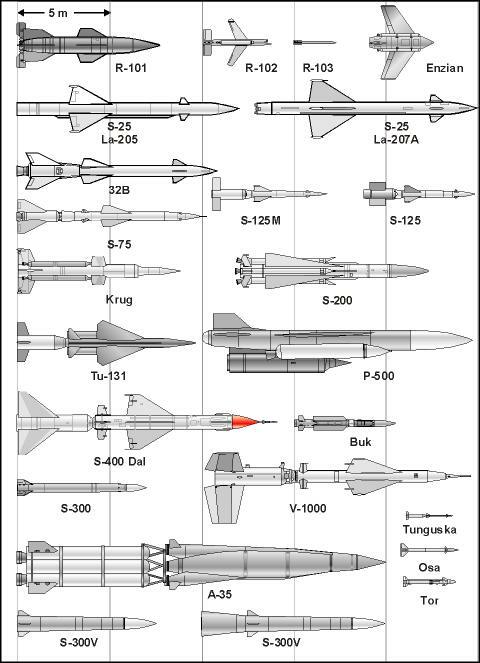 These missiles are given different NATO designations. However any mix of the two missiles can be loaded as needed in the vertical launcher cells. Tu-131 Russian surface-to-air missile. Tupolev design for a long-range air-breathing surface-to-air missile. Never got beyond the design stage. R-500 Russian surface-to-air missile. MiG design for an equivalent to the US Bomarc extremely long-range surface-to-air missile. Never got beyond the design stage. A-35 Russian anti-ballistic missile. First operational Soviet ABM system, going into limited operation around Moscow in 1972. A-350Zh Russian anti-ballistic missile. Initial version of the A-35 used in the A-35M system. A-350R Russian anti-ballistic missile. Radiation-hardened version of the A-35 used in the A-35M system. 218 missile Russian surface-to-air missile. The 218 was a version of the 217M with a nuclear warhead, which entered service in 1964. RM-217 Russian surface-to-air missile. Drone version. S-300 Russian surface-to-air missile. Third generation family of surface-to-air missiles developed in the 1970's based on new principles. The same launch system could use either 5V55 or 48N6 series missiles, of both mid- and long-range types. RM-217M Russian target drone. Retired 217M missiles converted to use as target drones were given this designation and used in a large number of versions (code named Zvezda-1, -2, -3, -4, -4MV, -5, -5F). Antey-2500 Russian surface-to-air missile. The Antey-2500 was a new generation of the S-300V, capable of shooting down re-entry vehicles of IRBMs of up to 2500 km range. S-225 Russian anti-ballistic missile. Anti-ballistic missile system developed in parallel with the A-35, but not put into production. 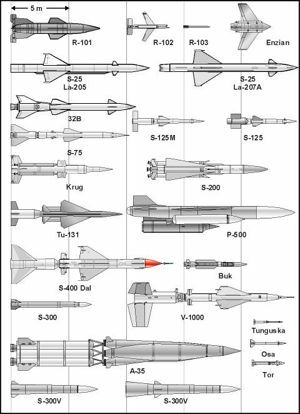 Kub Mid-range integral rocket-ramjet Russian surface-to-air missile, widely deployed with Soviet forces and exported to 22 countries. The missile provided one of the great technological surprises in warfare in the October 1973 Arab-Israeli War. A-35M Russian anti-ballistic missile. Improved version of the A-35 with radiation-hardened missiles and command centers, improved radars, and capability against tactical missiles fired from Europe against Moscow. Went into operation in 1978. A-135 Two-tier Russian anti-ballistic missile system for the defense of Moscow, with both endoatmospheric and exoatmospheric interceptor missiles. After protracted development, the system was said to have gone into operation in 1995. 51T6 Russian anti-ballistic missile. Exo-atmospheric interceptor component of A-135 ABM system. 53T6 Russian anti-ballistic missile. Endo-atmospheric interceptor component of A-135 ABM system. S-400 Russian surface-to-air missile. Fourth generation surface-to-air missile system that replaced the Army's S-300V (SA-12) and the Air Defense Force's S-300PMU (SA-10). The system would feature twice the engagement area of the S-300PMU. Initial service was by the end of 2007. V-880E Russian surface-to-air missile. Export version. 9M83 Russian surface-to-air missile. Anti-tactical ballistic missile; inner-layer defense. 9M83M Russian surface-to-air missile. Anti-tactical ballistic missile; inner-layer defense. 48N6E Russian surface-to-air missile. Improved version of the 48N6 for the S-300PMU-1 48N6E and S-400 systems, capable of shooting down tactical ballistic missiles at incoming speeds of 4.8 km/s or hypersonic targets flying at 3.0 km/s at 150 km altitude. V-880M Russian surface-to-air missile. Fakel-designed missile; not widely exported until 1980s. 9M82 Russian surface-to-air missile. Anti-tactical ballistic missile; outer-layer defense. 9M96 Russian surface-to-air missile. Improved, longer range version of 9M96 for the S-400. Four 9M96's can be housed in a single 48N6E launch container position. S-300PMU-1 48N6E Russian surface-to-air missile. Version of the S-300 system for the land forces and export using the advanced 48N6E missile, which doubled the range and greatly increased the effectiveness of the system. Alternatively any of the earlier model 5V55 or 48N6 series missiles could be loaded. S-300PMU-2 Russian surface-to-air missile. Version of the S-300 system for export using the advanced 48N6E2 missile, capable of shooting down tactical ballistic missiles. S-300PMU-1 9M96 Russian surface-to-air missile. New version of S-300PMU with 9M96E and 9M96E2 rockets. The system could also fire earlier-model 5V55 or 48N6 series rockets. S-300PMU-1 9M96E Russian surface-to-air missile. Shorter range version of 9M96. 9M82M Russian surface-to-air missile. Anti-tactical ballistic missile; outer-layer defense. S-300PMU-1 5V55U Russian surface-to-air missile. Version of the S-300PMU system for export using the 5V55U missile. S-300PMU-1 9M96E2 Russian surface-to-air missile. Longer range version of 9M96. S-500 New anti-aircraft, anti-missile system design in competitive development with Antey's S-400 to produce a Russian equivalent to THAAD.